I’ve been overweight all of my life, but when I hit the big 200 for the first time, I knew it was time to make a change. I had bounced around some; 170’s had been comfortable and 150’s meant I was doing well…but at 5’3, I was never what you would call fit and a size 12 was an acceptable medium. The day I stepped on a scale and saw 200, I knew I was done letting weight gain happen to me, I was finally going to do something about it. I looked around for a place to start- what were the fit people doing? That was when I began to see running as something other than to be avoided; many runners appeared lean, so maybe there was something to it. Start up costs were cheap enough, just some shoes and some Gu (which I learned to love). I found a couch to 5k podcast called Chubby Jones (warning, not for kids) and with the help of my headphones, I went from being able to run for a minute at a time to running for an entire 30 minutes. With all the running, moderate diet change and some whole food cleanses, I lost 50 lbs…and then I got pregnant and had my beautiful son. The company I work for allows its employees to participate in a wellness program. If you agree to an annual health screen and to take certain steps to a healthier lifestyle, you get a credit on your medical plan. It was at my wellness screen in 2011 that I found out I was back at 200lbs. You could say I had just had a baby, but that was not an excuse I was willing to live with. For the second time, I was done letting weight gain happen to me and decided to take action. I got back into running, reached out to friends that were runners who were all very supportive, pushing me when I needed it. I also joined a running club and the camaraderie of the group helped to motivate me further. I made some big goals and I accomplished them – in 2014 I was back down to the 150’s and completed a marathon – a seemingly impossible feat! How far I had come from who I used to be; inactive and unmotivated to make any physical changes. Now I could do anything! So what was next? I had always admired strength and I now knew I could do the impossible…so why not try bodybuilding? 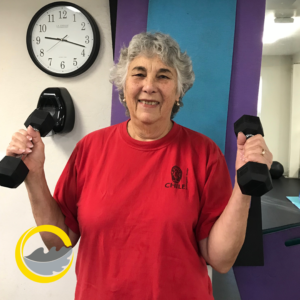 I have left 30 lbs amongst the free weights, cardio room and SCC at Sun Oaks, and I am grateful for the encouragement of the staff and the other early morning regulars. In just 9 months I again did the impossible; got up on a stage and showed off all of my hard work in a Women’s Figure competition. Did I win? It depends on what that means to you. I could say I didn’t take home any trophies but I don’t think that is accurate – my transformation is my trophy. It took heart to do what I have done, mental fortitude and a willingness to push past any perceived physical limitations. I am a different person today than I was even a week ago, and I am forever grateful for the experience. The only question now is: what’s next?! See you in the gym, fitness family! 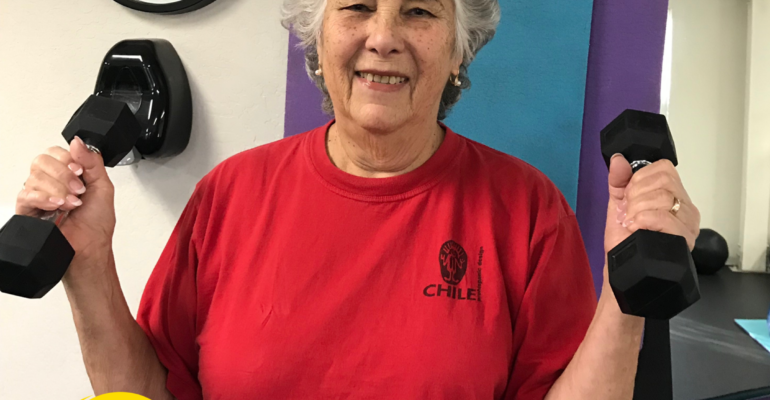 I recently completed Nancy Cardoso’s 1 day swim clinic at Sun Oaks and wanted to take this opportunity to share what an incredible impact it has had on my life. I have significant anxiety with swimming stemming from lifelong asthma and a fear of not being able to breathe while in the water. I participated in David Schauer’s Water WOD classes last summer. He was instrumental in teaching me the basics of freestyle swimming, but I certainly have a long way to go. I could not keep up in the class and often have to revert to a kick board. I signed up for Nancy’s clinic hoping I could be a more efficient swimmer and maybe overcome some of my fear in the water. Nancy went above and beyond what would be expected of a coach. 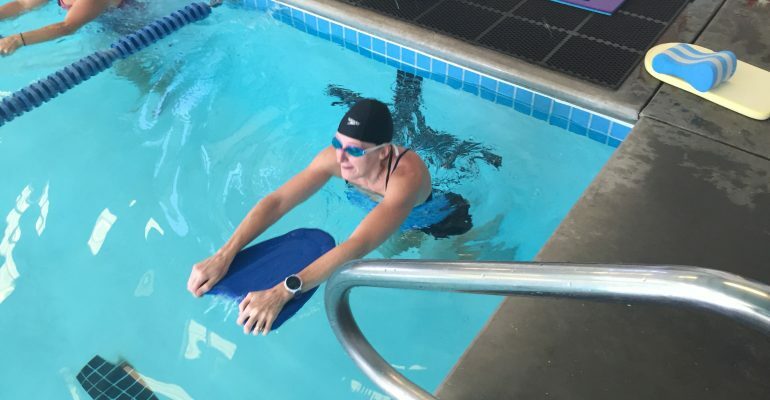 She taught basic steps to learn a new technique that uses far less energy than just trying to madly kick and stroke to get to the other side of the pool. The class included all levels of swimmers from the most inexperienced (me) to avid swimmers. I thought she was able to meet the needs of each individual participant with patience. At one point, I became near paralyzed with fear at the thought of crossing 25 meters. Nancy pulled me aside and was able to help me get ahold of my emotions and fears. She swam right next to me, coaching and supporting me the entire time. She had confidence in me, when I could not have any in myself. Her encouragement and patience helped push me past that terrifying place that had kept me from swimming for so many years. I could not have broken through that place of fear without her persistence and encouragement. Since that class, I have returned to David’s Water WOD class. He has noticed a profound improvement in my technique. I have not had to rely on the kick board and David has been supportive in reinforcing the same techniques that Nancy taught me. I still have a long way to go before I can call myself a swimmer, but Nancy and David have given me all the tools to start. I strongly encourage anyone struggling with swimming anxiety or if they just want to improve their technique, to invest the time into Nancy’s swim clinic. I can honestly say that she, and the clinic, have changed my life. 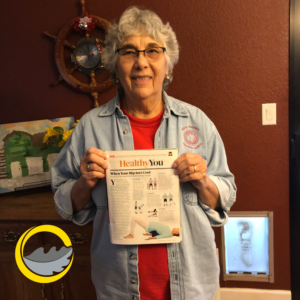 Email Nancy today to schedule your 1-on-1 swim lesson! Today I finished my 6 week, twice a week season of Tribe Life. In our final 35 minute workout, I completed 134 push-ups all on my toes! I have always done weight lifting and cardio, but I have gained so much more strength and stamina doing Tribe Life. We are all challenged and encouraged by Brooke to push ourselves that little bit more. The class always fills me with energy, gives me a positive attitude for the day. I have awoken muscles I didn’t know I had. Plus I have never seen my husband below 200 lbs, 192 lbs and looking so good! I actually only started Tribe Life to encourage my husband, Dan, but I ended up seeing myself grow immensely. I love that I get strength training, Cardio and stretching all in 35 minutes. I love the weighted viper and body weight exercises, and it’s fun to be a part of a team that encourages each other to do our best! For anyone who wants to reshape their body and meet great friends, I highly recommend Tribe Life. Looking forward to trying Tribe Fit and Tribe Punch too! I am finishing up my first session of Tribe Punch with David Schauer. I have been a client of David’s for a year now and was in his WOD class before joining Tribe. 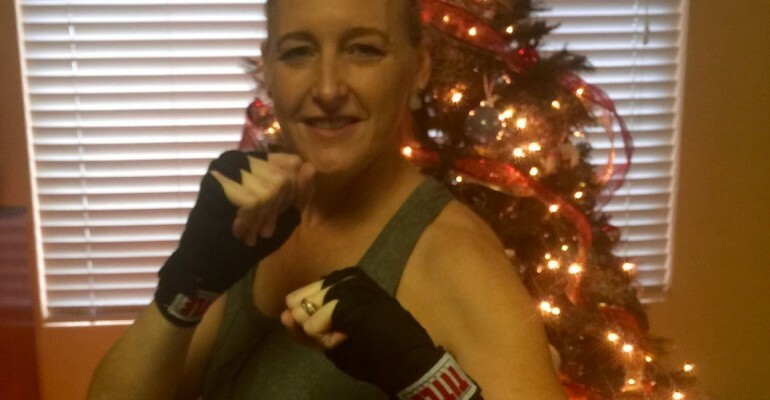 I was initially unsure about Tribe Punch because I have a somewhat passive personality and did not think that boxing or kickboxing would be my thing. 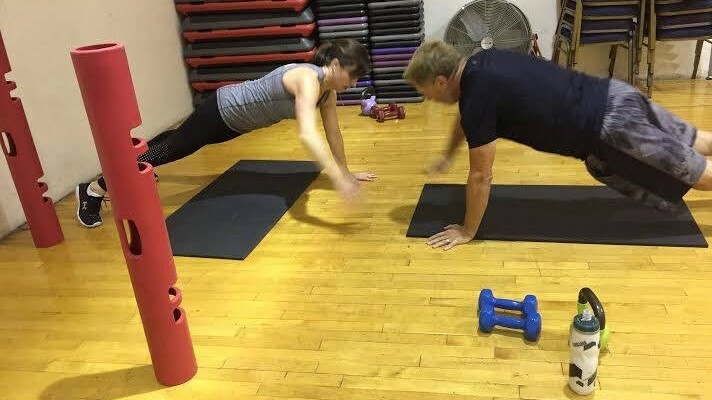 Because I wanted to stay with my amazing trainer and was fearful of losing the strength I have gained with David, I reluctantly signed up for Tribe Punch. What an amazing experience! I actually had fun, gained even more strength, improved my endurance and met new friends! David took the time to show us all the techniques of Punch and even worked out with us, running up and down that gym, encouraging us along the way. After two weeks, I was hooked! Every workout was different with stations that included core work, cardio and strength building. I found after I gained confidence that I loved the one on one session with the coach and comradery with my team. It is competitive in that scores are kept and the team member with the highest amount of repetitions for all the exercises is deemed the winner of that night. I personally would just compete with myself for my personal best, but the scoring gave me a benchmark of where I felt I could, or should be. 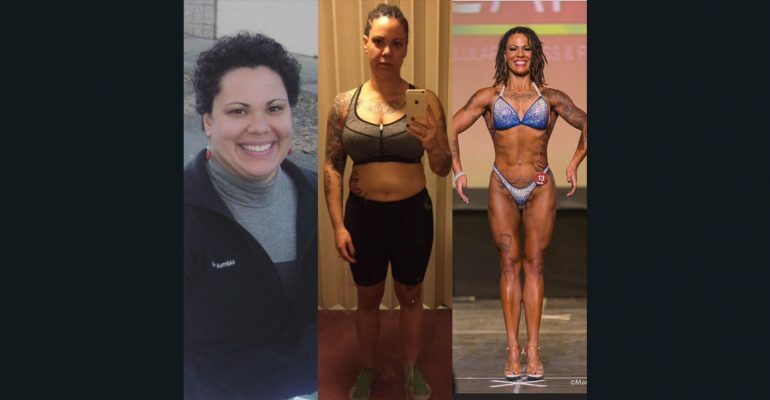 I found that this training program challenged me physically and mentally, and provided a fun change to the workouts I had become comfortable with. The program is well worth the investment! I plan on trying another Tribe class and then probably returning again to Tribe Punch for more! Thank you for bringing Tribe Fitness to Sun Oaks!